The majority of people in this part of Co. Galway would have come from a farming background or at least a previous generation would have done. Their background would have given them a close bond with horses as the horse was the forerunner of the tractor and the horse was the power source that operated farm machinery and farm transportation of times gone by. For one family in Mullaghmore their love of horses has granted them a place in both local history and in the world of Irish Racing History. To own a thoroughbred racehorse is a milestone but to own one that won an Irish and an English Grand National in successive years is a feat that is reserved for very few individuals to achieve. On Saturday, April 10th. 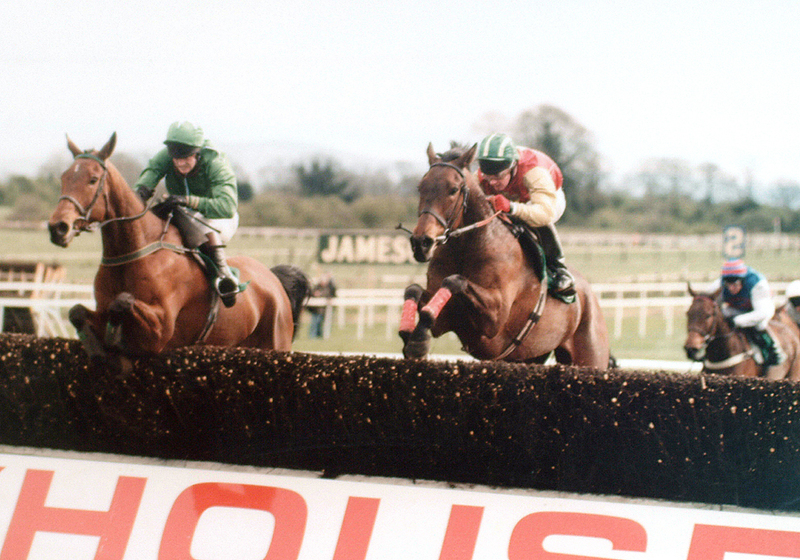 1998 Bobbyjo won the Irish Grand National whose sponsors incidentally were Jamesons Whisky – the same Jameson family whose ancestors owned the land around Mullaghmore from 1800 to 1910 and in memory of whom there is a plaque outside the RTE Studios at Montrose, Dublin identifying Jamesons as Landlords of Montrose and Windfield. The Jameson family having owned the Big House to the left as you view the RTE Complex from the Stillorgan Road at Donnybrook and where RTE moved into after leaving their original premises at Henry Street. 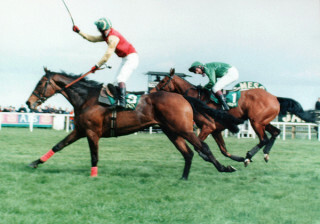 In 1999 Bobbyjo arrived at Aintree having won the Irish Grand National in 1998, however this was not regarded at the time as a good pointe to Grand National success as Irish trained runners had failed to win the race for twenty-four years. Bobbyjo went on to win the Aintree Grand National, one of the worlds premier and most sought after titles in the racing world. The win also ended that twenty four year gap in Irish racing history as Bobbyjo’s trainer, Tommy Carberry, had ridden L’Escargot, the last Irish horse to achieve this accolade in 1975. The victory of Bobbyjo in both the Irish and the English Grand National Events was a major achievement for the Burke family but they was also a victory shared by the surrounding area and the horse was brought to Mountbellew by Tommy Carberry and his son, Paul, who was riding the horse. The horse was taken on a tour of all the surrounding villages. 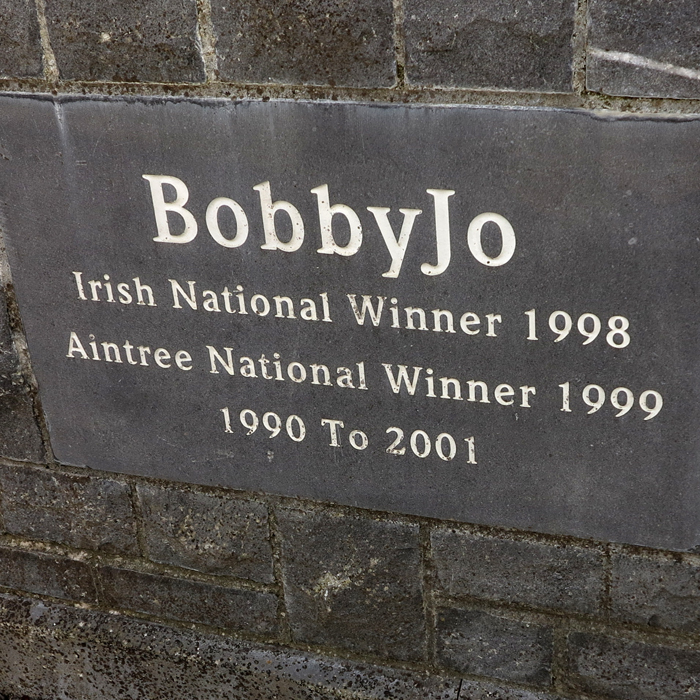 Bobbyjo broke a knee at Fairyhouse Racecourse in February 2001 and had to be destroyed one month later due to his incurable injuries. In memorial of the horse, a new steeplechase first run at Fairyhouse Racecourse in February 2003 has been named after him. On March 22nd. 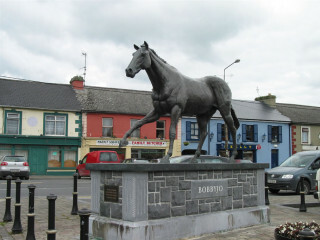 2002, a life sized bronze statue of the horse was unveiled in Mountbellew. 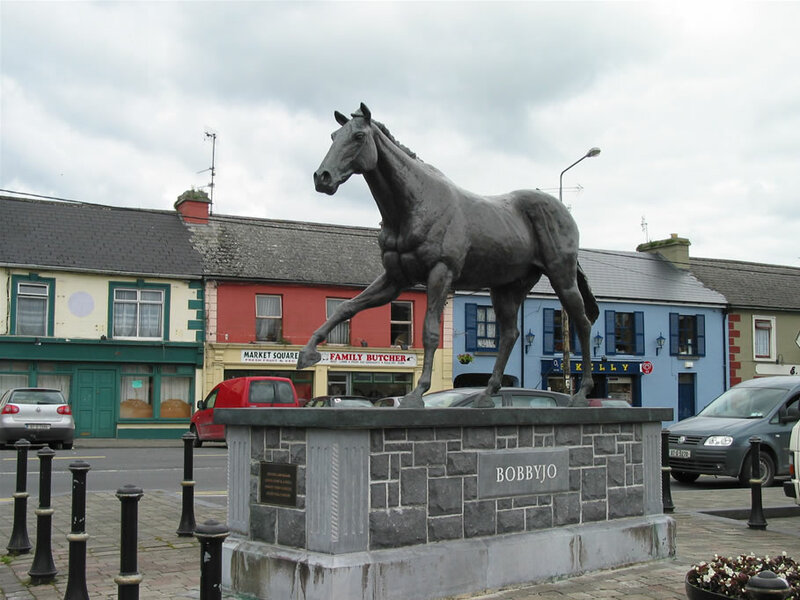 The Statue is the work of Galway born sculpture John Coll and is a fitting commemoration to the great hero Bobbyjo. 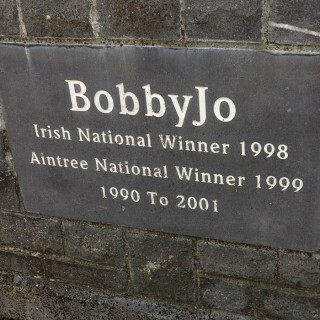 Bobbyjo is buried in Mullaghmore in the field where he was reared, in part of what was the old Jameson Estate, and the area is now marked with a plaque. The memories and the achievements of BobbyJo will live on in the area for generations to come. I notice from recent notices that the man associated with training this horse, the great Tommy Carbury of Kilbrew Demense passed away on Wednesday, July 12th 2017. He will be remembered as one of the greats of the racing world. R.I.P. Great website. It must take a large chunk of work but well done on your commitment. Great to see local topics and events on a website. I well remember that horse. I was lucky enough to have won 167 punts on a beautiful Saturday afternoon in Rathmines when I was allocated him in a works draw.